A Neuron is a specialized nerve cell that receives, processes, and transmits information to other cells in the body. We have a fixed number of neurons, which means they do not regenerate. About 10,000 neurons die everyday, but since we start out with between ten and 100 billion (Hooper & Teresi, 1987), we only lose about 2% over our lifetime. Information comes into the neuron through the Dendrites from other neurons. It then continues to the Cell Body – (soma) which is the main part of the neuron, which contains the nucleus and maintains the life sustaining functions of the neuron. The soma processes information and then passes it along the Axon. At the end of the axon are bulb-like structures called Terminal Buttons that pass the information on to glands, muscles, or other neurons. 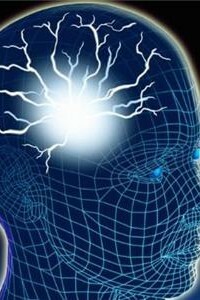 Information is carried by biochemical substances called neurotransmitters, which we will talk about in more detail shortly. 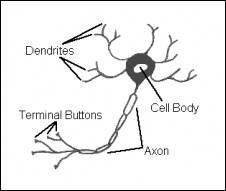 The terminal buttons and the dendrites of other neurons do not touch, but instead pass the information containing neurotransmitters through a Synapse. Once the neurotransmitter leaves the axon, and passes through the synapse, it is caught on the dendrite by what are termed Receptor Sites. Neurotransmitters have been studied quite a bit in relation to psychology and human behavior. What we have found is that several neurotransmitters play a role in the way we behave, learn, the way we feel, and sleep. And, some play a role in mental illnesses. The following are those neurotransmitters which play a significant role in our mental health. Too little GABA is associated with anxiety and anxiety disorders. Some antianxiety medication increases GABA at the receptor sites. Please note that these associations are merely correlations, and do not necessarily demonstrate any cause and effect relationship. We don’t know what other variables may be affecting both the neurotransmitter and the mental illness, and we don’t know if the change in the neurotransmitter causes the illness, or the illness causes the change in the neurotransmitter.